Thing that annoys me working in retail in the UK, specifically England, is non-Bank of England banknotes, and people insisting that we have to accept them as payment when someone's doing their shopping. Anyone else get this sort of thing? Anyone else in the UK have any thoughts on this? AIUI, you're correct. You're not obliged to trade - you can refuse any trade at any time (providing the person you refuse can't prove that it was on the grounds of specified forms of discrimination that are outlawed). A basic principle is that it's the customer who offers to trade, and you decide to accept or decline. That said, it's normally, I would think, not worth fighting over. Particularly for BOS and RBOS notes. You won't get in trouble for accepting legal currency. There's actually plusses and minuses to them, in theory. The minus is, if your company goes bust (or near to it), it can't rely on using those notes to pay its creditors. So there's a (small but non-zero) risk attached to them. The plus is, they're not susceptible to bank runs - the bank has to actually have enough gold to pay you back if you demand it. Then again, the banks could always go bust thanks to a run on other debts, which is another risk. The main issue for us probably stems from not wanting to send off counterfeit notes when we do our banking (if it happens then we get notified of it, and if it happens too often then higher-ups have to start investigating our practices, and the practices of individuals). Since we're allowed to refuse them, if we don't feel like we recognise the design or the watermarks or whatever of a given note, then from an individual standpoint, refusing it is the safest option, rather than run the risk of it being fake and getting pulled up on it (I mean, we run that risk with every transaction anyway, but obviously the more familiar we are with a note, the more we'll be able to spot forgeries, at least in theory). Bank of Scotland and Royal Bank of Scotland £5 notes do actually show up quite a bit, so we tend not to argue over those (there's bound to be one in the till at some point during the week, but we don't give them out as change), but the less familiar we are with the bank or the note, the more likely we are to ask for something else (company policy regarding BoE £50 notes, for example, is to only accept them for fuel payments, and only if they have no other means of paying). RBS £5? Fair. Clydesdale £10? At a push. BoI £20? Good luck. Danske Bank £50? Not a chance in hell. They're not legal tender in England. Even I over here in Leftpondia know that much! Heck, the Scottish ones at least aren't even legal tender in Scotland! Now, as far as I'm aware, only Bank of England banknotes are legal tender, and even then only in England and Wales, and my understanding of that is that, for example, if you ate something in a restaurant in England or Wales, and then wanted to pay for your meal, if you paid in BoE notes then the restaurant are legally obligated to accept that as payment, but they are legally entitled to refuse payment in any notes printed by the three Scottish banks and four Northern Irish banks which are permitted to print banknotes (from what I've read "legal tender" applies as "payment for debts that cannot be refused"). So, someone walks in, puts a few things in their basket, brings it to the till. Everything scans through fine, and then they hand over a Danske Bank £20 note. Now, I'm really not familiar at all with Danske Bank notes. I know Danske Bank exists, and I know they print banknotes, but up until that point, other than a cursory glance online, I had never seen one in person. As far as my understanding goes, I'm within my rights to refuse that as payment. Danske Bank notes aren't legal tender, and the customer is not in a position of debt (they haven't consumed or used anything yet, they haven't taken taken anything with the promise of eventually paying for it, they're just offering me something in exchange for goods they wish to take after payment). That banknote (assuming it wasn't a forgery), would certainly be legal currency, which I think is to do with what the government considers representative of "money", but we could also accept carrots as payment if we wanted to, just that the value of currency wouldn't be backed by the government. The BoE says "[a] shop owner can choose what payment they accept. If you want to pay for a pack of gum with a £50 note, it’s perfectly legal to turn you down. Likewise for all other banknotes, it’s a matter of discretion. If your local corner shop decided to only accept payments in Pokémon cards that would be within their right too. But they’d probably lose customers" and everything I've read suggests that that advice is accurate, so if someone hands over a £50 Bank of Ireland note, or a Clydesdale Bank £20 note, I'm going to refuse it. I do not see them enough to know how to check with any level of certainty whether they're real, and no amount of "it says "Sterling" on it", or "it's legal tender" is going to make me change my mind, until someone can thoroughly correctly. Curious: barring a shop policy, is it the actual bank notes you don't like dealing with or is it rude and entitled customers who don't know the rules? It's mostly the customers insisting that their money means something it doesn't. I once had someone argue that a BoE £5 note has the words "legal tender" written on it. Handed it back, asked them to point it out (hint: it doesn't). I suppose it's one of those "misconceptions from the other side" sort of things. People use money every day, and have these ideas about what things like "legal tender" and "sterling" mean because they're just repeating what they've heard everyone else saying, but then when that mundane, vague thing becomes something you have to pay attention to, and learn about, hearing those misconceptions becomes a bit jarring, especially when they're repeated over and over again. But, no, I don't particularly like dealing with certain notes from certain banks. I think like most people, I learn through familiarity and repetition. If I don't see something often enough, I won't recognise it properly. In the case of money, that means risking losing the company money, and potentially my own job. I stupidly once took an old £50 a year or two ago because I hadn't seen one of the new ones in a long while and still recognised John Houblon on the back, which meant losing £40 that day from my till. Not a lot in the grand scheme of things, but not something I'd like to repeat any time soon. What about coins (or banknotes) from Jersey, Guernsey or Gibraltar? From what I can remember, the same policy applies, i.e. we can refuse them, and I think their coins aren't legal tender either (while those coined by the Royal Mint are throughout the UK). We never see notes from the Crown Dependencies or Gibraltar, which helps, and their £1 coins didn't change to the new 12-sided design currently used by the BoE, so we basically don't see them at all any more. The odd 20p will turn up, but for that amount, what's the point? Sensible, and very interesting! The closest thing we have to an unfamiliar design is the two dollar note. And anymore any of the "old style" notes that they began phasing out in the 1990s or so. (With the exceptions of the $1 and $2 of course). Actually, I'd never even heard of Danske Bank before!, though I knew NoIr has a few note issuing banks. It's mostly the customers insisting that their money means something it doesn't. I once had someone argue that a BoE £5 note has the words "legal tender" written on it. Handed it back, asked them to point it out (hint: it doesn't). Maybe an American. Ours say that. Yours say "I promise to pay..."
I suppose it's one of those "misconceptions from the other side" sort of things. People use money every day, and have these ideas about what things like "legal tender" and "sterling" mean because they're just repeating what they've heard everyone else saying, but then when that mundane, vague thing becomes something you have to pay attention to, and learn about, hearing those misconceptions becomes a bit jarring, especially when they're repeated over and over again. Assuming the note wasn't fake, why would you lose any money? Wouldn't your company's bank accept it in deposit? Or was it like, really really old? Another question: anyone still trying to spend round pounds? Or is that pretty much settled down? In the case of money, that means risking losing the company money, and potentially my own job. I stupidly once took an old £50 a year or two ago because I hadn't seen one of the new ones in a long while and still recognised John Houblon on the back, which meant losing £40 that day from my till. That's weird! The old banknotes are still valid - the Bank of England accepts them at face value in any quantity. Other banks also accept them, but I think only voluntarily, and they may decline if you've got too many of them (particularly of £50s, which are only used for money laundering and drug dealing anyway). We've had a number of customers refuse to accept non-BoE notes in their change, basically for the same reasons we don't accept them (they don't recognise them), and because, well, they know that some places might not accept them (because they don't recognise them). I'd say it was more common to get that sort of reaction down south that up here, but that's just from my experience. Nope. English, and local, i.e. they live in the next village over and come in every day. The "promise to pay" thing, I think, goes back to when the value of the pound was backed by gold. So someone with a £5 note (the bearer) could take that note to the bank (the one making the promise) and exchange it for gold. Could be wrong about that. I'm never sure if the one making the promise is just the bank (who issues the note), or if the one making the promise is the person handing over the note. I'm actually not entirely sure why they say that. The BoE is willing to exchange any of its withdrawn banknotes for current ones (I'm not even sure there's a cut-off for that), so strictly speaking the company could just get it exchanged. I assume, though, that it comes down to the "legal tender" issue Sal brought up, i.e. they "can't rely on using those notes to pay its creditors" if something happens. So if someone pays for something with an old £50 note, and we give them £20 in change, then the company might see that as "£30 we can't use to pay debts". It's "non-money" until exchanged. Like I said, though, I'm not sure. We just get told by higher-ups that this sort of thing loses money (part of me thinks it's just a scare tactic). Hmmmmm, they turn up from time to time (two weeks ago was the most recent one I had), but they've definitely gotten rarer. When they usually turn up is when people are trying to pay for something with a mass of £1 coins. Either they haven't noticed because they've been collecting up all they're change and only use it in emergencies (which some people in my family do), or they've found an old £1 (either because they've had it forever, or another shop has given it to them as change to get rid of theirs) and are trying to hide it in a mass of £1 coins to sneakily get rid of it (not realising that some of us can tell the difference at a glance just by looking at the side of the coin). Well, damn it. After placing around 300,000 blocks, I decided to go in search of an ocean in my Minecraft world so that I could start some work on the possibility of a port to go along with the castle and nether-inspired temple that I started last week. Backstory: My laptop randomly decided to die a few weeks ago, and when I started Minecraft back up my main world was gone, but my superflat redstone world was still there. After some messing around, my brother managed to get my main world back, or so I thought. So, an the way to try and find a relatively nearby ocean, I noticed some errors starting to appear in the terrain, with chunks that appeared to be "empty". 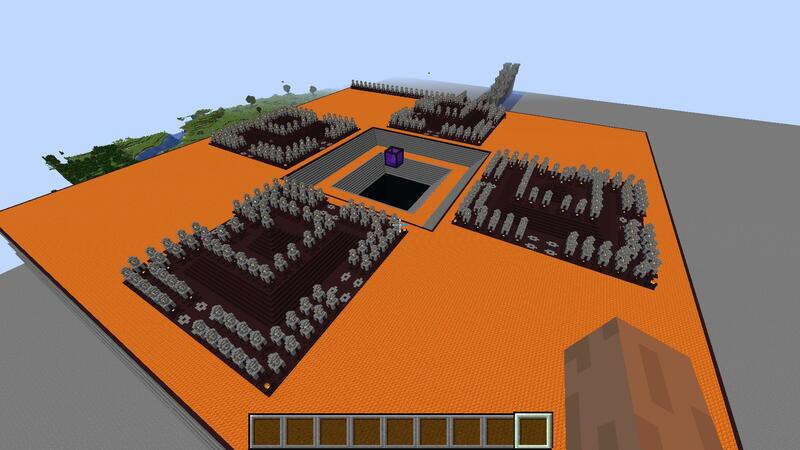 Little bit further and everything was the default superflat world of my redstone world... The only chunks that appeared "correct" were the ones that I had loaded before my laptop died, meaning that there's maybe a 1000 x 1000 block area that's okay. Because I wanted to give myself room to expand, I now have to start all over again in a new world. I mean, good thing is I still have the original design to work from, and I'm happy with that, but it's just going to mean having to rebuild it all over again. It's the governor of the bank of england - he actually signs the promise (well, not personally, anymore). Of course, these days the governor only promises that if you give him a £5 note, he'll give you back a different £5 note, which is less useful. Nonetheless, this does mean that the bank is required to replace old bank notes with new in perpetuity (although I suspect very old banknotes would be worth much more than their face value anyway). As I mention above, for scottish banks it's different - they do still have to give you your gold, aiui. Does anyone other than me follow the Iditarod? Aliy Zirkle's currently in the lead (for as much as that's worth at this point), she's taking the risk of pushing on to the Iditarod checkpoint (roughly halfway through the race) for her mandatory 24-hour rest rather than stopping at the previous checkpoints of Ophir or Takotna like the other frontrunners. She's my favorite musher so I'm hoping it pays off for her. She's had six top 10 finishes, three of which were in second place, so I'm really rooting for this to be her year at #1. Actually no, I don't follow it, but it is really quite the amazing feat. Just to compete!, let alone finish and let alone win. I think it doesn't get the attention it deserves as a sporting institution. But neither do any of the other Great Races. Generally, we won't hear about Iditarod down here in the Sunlands until the frontrunner is either very close or has finished. Or if a musher dies. Or there's a disaster. And then it's back to football or whatever is going on this time of year. The Iditarod, like the Marathon, is historically significant. I suppose anti-vaxxers are against the Iditarod on ideological grounds. I made a major language gaffe and I'm ashamed I wrote "I'd just assume not know" instead of "I'd just as soon not know". I know that using "assume" makes no sense but I wrote that because that's what it sounds like. Did I really not think about what I wanted to say? I know the phrase "just as soon", but I was not thinking about what I wrote when I wrote it. This is as bad as when people say "for all intensive purposes"! I counsel you to recite the Litany of "There, They're, Their" 100 times, so you may turn away from the dreaded Typo and return to the divine embrace of English spelling. I absolve you from your sins in the name of Prescriptivism, and of the Dictionary, and of the Holy Spellcheck. Go in piece. Supposably this is a problem. I would just as soon it's a thing. Well at least we can call this matter clothesed, thanks to the swift actions. I'm sorry you're feeling this way. Was this in a paper or something you had to submit for school, and you only realized after you had already turned it in? If your professor is a reasonable person, they shouldn't hold it against you, and I doubt one mistake like that will significantly hurt your grade. This year, I've decided to completely give up splitting infinitives for Lent. That which Descriptivity put asunder, let no man ill conjoin! Not quite that bad, thankfully. Just something I posted on another website. It went unnoticed for a while until a user pointed it out to me. I can't believe I didn't notice it It just bugs me because I have a reputation of being the language expert there (among mere mortals, not on conlanging sites lol). I sure hope I've never made a mistake like that in a paper! Thank god my brother suggested an editing tool for Minecraft! I've had the week off work, so I could try to redo the work I had done in my old world after finding it went, well, a bit wrong Last time it took me around, oo, 40 hours of game play to reach where I was. This time round I roughly caught up in about 16 hours, and it's also meant I've had more time to fill in the walls and floors properly, although I've sacrificed working on the interior for the moment (I think I can do a better job of that this time round, having learnt from my attempts in my old world. 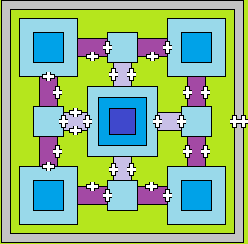 The general thing is that to get from the front gate (on the right), to the central building, you'd need to pass through a further three gate houses, and none of the buildings on the exterior can be reached directly from any other building without passing through at least one gate house (either "exterior" in dark purple, or "interior" in light purple). So if, say, you took the building on the bottom right of that image, you'd then have to come back out to take the building either above it or to its left. The interiors, likewise, are divided, either into two or three parts, such that taking one division of a given building doesn't mean the entire building is automatically captured, and you'd either have smash through stone walls, break through floors, or go back to the main entrance to that building to start again. 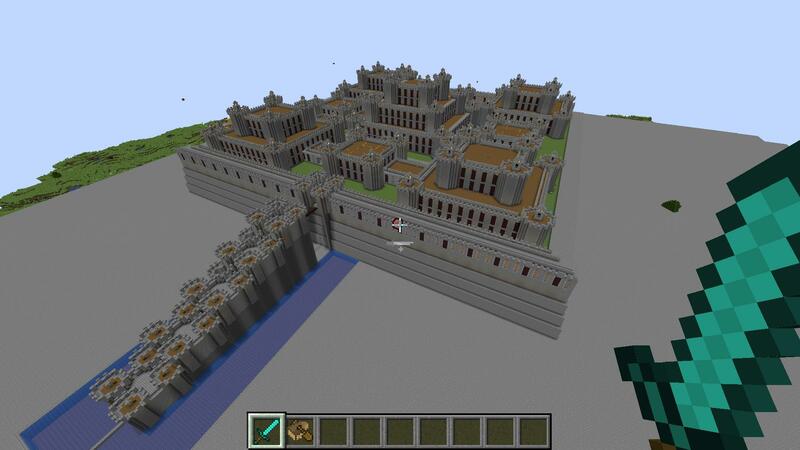 I think it would be pretty safe to say, though, that once you get to the rear interior gate house (on the left of this image), and managed to break through, taking the rest of the castle might be pretty easy (especially if you could get to the parapets, where you could fire arrows down onto lower roof sections and interior areas. Which is literally just a glorified nether portal. It's just there as a surrounding environment for that central nether portal, although I may throw in more "functional" structures in the currently empty corners. So imagine a procession, coming from the outside, then you'd walk to the smaller "islands" with the raised centres, then follow some sort of path taking you, let's say left, into some sort of smaller "temple" where a priest might b reciting something from a scripture, saying a prayer or a blessing, anointing people, after which you'd follow the path to the right, walking over to the island anti-clockwise of where you started, following paths round across another bridge over to the central dip where you'd either take your place amongst some sort of congregation, or walk further up another path towards that nether portal, for whatever reason. The design behind it is obviously quite simple, but once you're in there, those pillars each stand around 10 blocks (10m) high, so I'd hope they give the impression of a high corridor without closing off the sky. Utterly off topic, but I just noticed that the letters 'phpBB' remind me of something Bill D. Cat once said, from ye aulde Bloom County comic. Daaaaaang! What a great idea to utterly and totally, and, pardon my french, while we're on the subject - avoid splitting infinitives for ye aulde Quarantesimaltide.